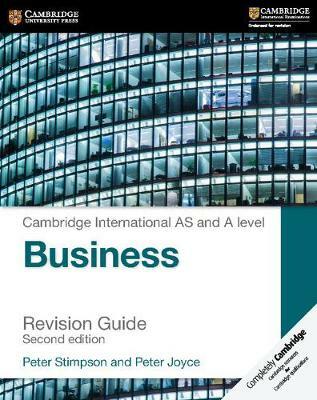 The Cambridge International AS & A Level Business Revision Guide helps students apply their knowledge, understanding and skills to succeed in their course. The Cambridge International AS & A Level Business Revision Guide helps students apply their knowledge, understanding and skills to succeed in their course. This endorsed Cambridge International AS & A Level Business Revision Guide has been designed to further develop students' skills for the Cambridge International AS and A Level Business course. Revised to meet the latest syllabus (9609) this book is packed full of guidance to reinforce students' understanding and skills to succeed in their course. Written in a clear style by experienced examiners this revision guide is perfect for international learners and accompanies the Cambridge International AS & A Level Business Coursebook (third edition).